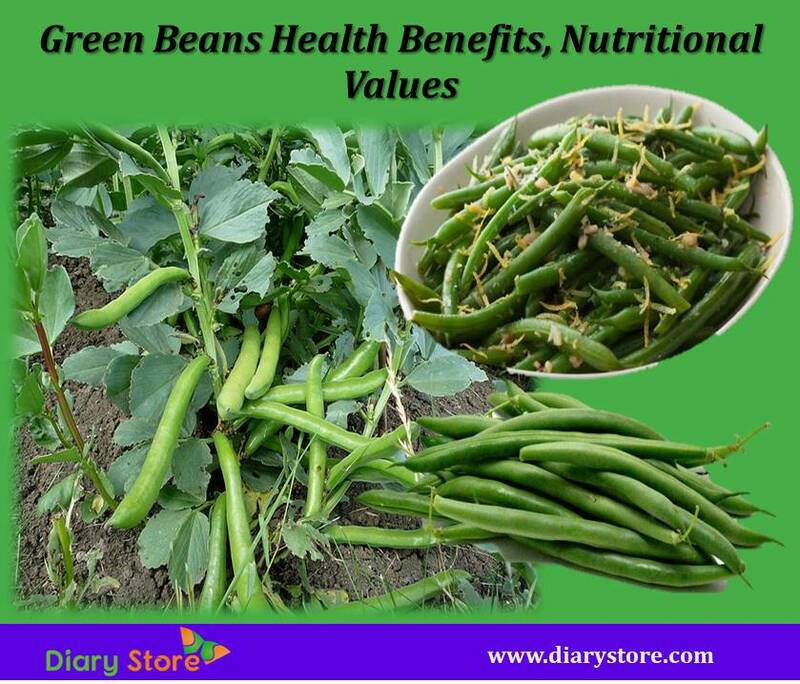 Green Beans have many health benefits including ability to prevent heart diseases, cancer, gastrointestinal issues and strengthen bones, protect the newborn babies. Green Beans can also improve eye health and boost the immune system. Green Beans are also called French beans, snap beans, fine beans, string beans, squeaky beans. It belongs to the Fabaceae family of the genus, Vicia, and its scientific name is Phaseolus vulgaris. Throughout the world there are approximately 150 varieties of green beans. They are in different colors and shapes but their nutritional content and health benefits remain similar. Almost all the varieties of beans are available year around across the world. Green Beans are the unripe or immature pods, so some people prefer to cook beans before consuming them. Green Beans are categorized into two types depending on their growth habits such as “pole beans” that need climb supports to grow properly and “bush beans” are lower to the ground, growing without the need of support. Green Beans are widely cultivated in Asia and Africa. Green Beans are helpful to reduce the risk of heart diseases because they have high amount of flavonoids protective to heart. Flavonoids are polyphenolic antioxidants that are commonly found in vegetables and fruits. Heart attacks and cardiovascular diseases are commonly caused by thrombotic activity. Good amount of flavonoids have massive anti-inflammatory properties, which regulate thrombotic activity in the cells and prevent blot clots in the arteries and veins. 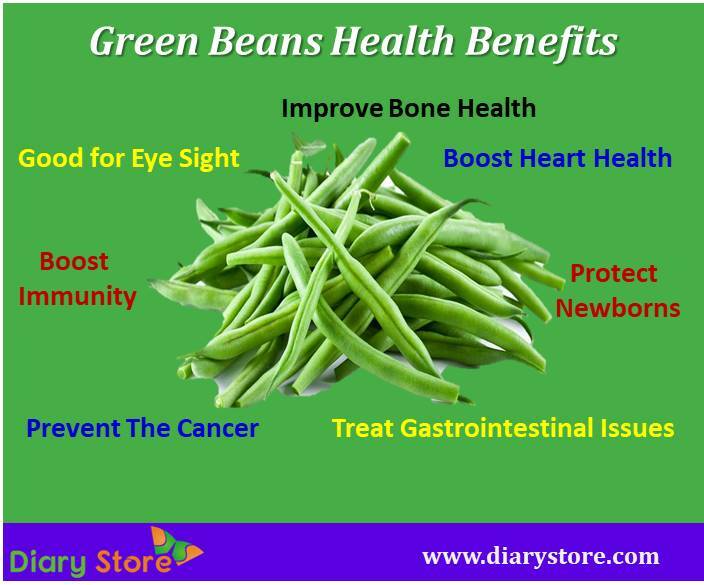 Regular intake of green bean is very helpful to improve eye health. Green beans are rich in carotenoids, lutein and Zeaxanthin. Carotenoids can play an effective role in preventing the macular degeneration, which is a condition that hampers vision and eye function. Lutein and Zeaxanthin are helpful to maintain good eyesight and night vision. Green Beans are helpful to prevent the cancer because they contain good amount of antioxidants. Antioxidants help to prevent the free radical damage activity in the body. Free radicals play a fundamental role in the development of cancer. New evidence suggests that regular intake of green bean can reduces the risk of cancerous adenoma recurrence and colorectal cancer. Green beans are good source of number of nutrients such as calcium, vitamin K. Calcium helps to prevent the bone deterioration and osteoporosis. Vitamin K helps to strengthen bones. Green Beans are also a great source of silicon which is a key element in bone regeneration and overall bone health. Green beans are rich in fiber which is highly beneficial in relieving certain digestive issues like acid reflux, hemorrhoids, ulcers and constipation. High fiber content in green bean also helps to maintain cholesterol and sugar levels in human body. 110 grams of green bean provides 15% of the daily recommended amount of fiber. Green Beans are a great source of folic acid which plays an important role to protect embryos in the womb. Folic acid decreases the risk of a large number of birth defects and prevents the neural tube defects. Green bean can keeps folic acid levels high and ensure a healthy and happy baby. Green beans contain good amount of vitamin-C and other well-known antioxidants which are helpful to boost the immunity system and fight against infectious agents and harmful oxygen-free radicals.